These are delicious! The beef is cooked all day and just falls apart. 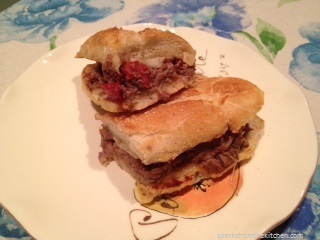 The very slightly hot peppers, the melty provolone cheese and the tomatoes makes this one tasty hot sandwich. Save some of the juice for dipping if you’d like. This cooks for 8 hours which makes it ideal for a weeknight dinner also as it can stay on ‘warm’ for a while after cooking. I put the roast in my slow cooker at about 10am on New Year’s Day. I didn’t really have any plans for the day except catching up on some DVR’d shows and doing some chores around the house and laundry but on a lazy day off it was nice to not have to worry about dinner and have such a delicious sandwich waiting for me. It also reheats really well. I brought some left-overs to work the next day, put the roll in the toaster oven with a slice of cheese and nuked the beef. It was delicious! Put the roast into the cooker. In a bowl combine the dressing mix and broth and stir to combine. Pour the mix over the roast followed by the tomatoes. Place the peppers into the broth around the roast. When the cooking is complete remove any pieces of fat from the beef or liquid and discard. Remove the roast from the liquid and set aside. Strain the liquid to remove any fat that may be left. Retain the strained liquid and tomatoes. Slice the rolls in half the long way. Heat a pan over medium/high heat. Melt a tbsp of butter and when foaming place the halves of as many rolls as can fit into the butter (interior side down). Weigh down with something (I used my tea pot) and cook until crisp. Remove from the pan and place provolone onto the bread and then top with some beef and tomatoes and cooking liquid if you’d like. As an alternate serve the cooking liquid in a small bowl along side the sandwich for dipping. Football season is back and I love making yummy food to have while we watch it. 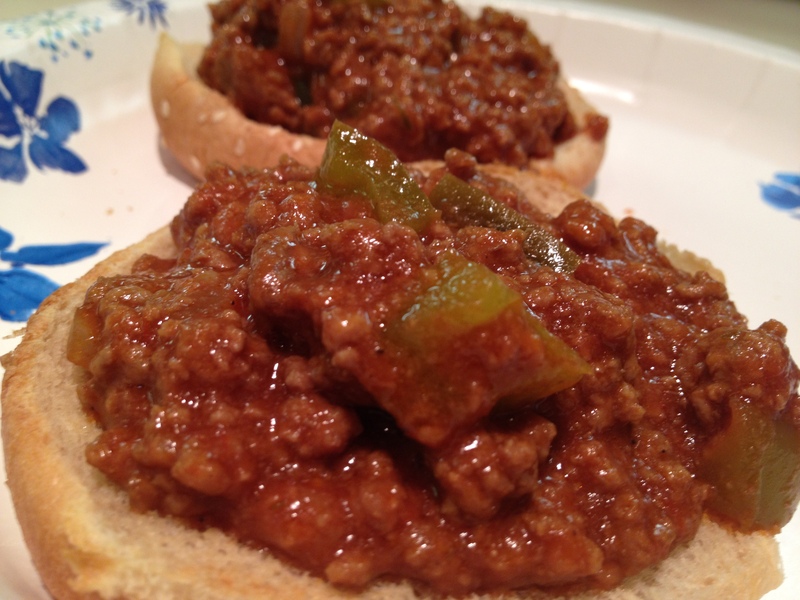 Since I’m now obsessed with my new slow-cooker that works so well I wanted to make Sloppy Joes. I looked all over the internet for a slow-cooker Sloppy Joe recipie for a slow cooker and didn’t find any that sounded right so I came up with my own. They were so delicious!! Just the right amount of sauce and a bit tangy. Perfect for a chilly Sunday evening. The ingredient list is small and they’re very easy to make. I eat mine open-faced as you can see below. They’d be great with some grated cheese on them as well. In a medium skilled over medium-high heat brown the beef until it’s almost done and then drain out the fat. Add the green pepper and onion and cook until the beef is done. Then drain again. Add the other ingredients and stir to combine. Add everything to the slow cooker and cook for 2 hours on low. Serve on toasted buns.